set some pre-defined settings for that server. only a few settings that this will change. One last thing we need to do is modify the file /etc/squirrelmail/config_local.php and comment out the $default_folder_prefix variable - if you don't do this, you will see the following error message in SquirrelMail after you've logged in: Query: CREATE "Sent" Reason Given: Invalid mailbox name. * You can override the config.php settings here. * Don't do it unless you know what you're doing. * Use standard PHP syntax, see config.php for examples. 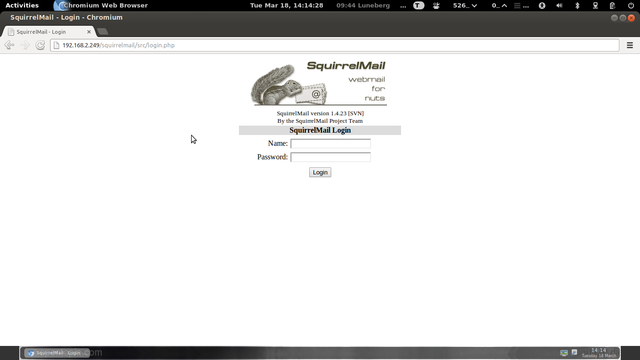 Now you can type in http://server1.example.com/webmail or http://192.168.2.249/webmail in your browser to access SquirrelMail. 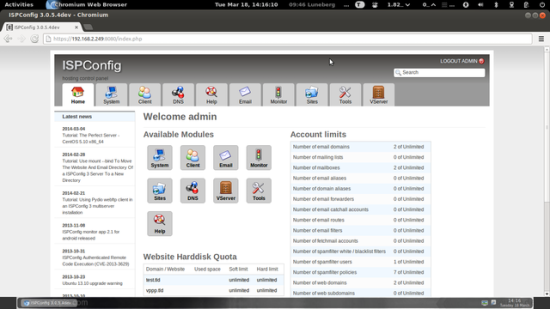 Download the current ISPConfig 3 version and install it. The ISPConfig installer will configure all services like Postfix, Dovecot, etc. for you. A manual setup as required for ISPConfig 2 is not necessary anymore. You now also have the possibility to let the installer create an SSL vhost for the ISPConfig control panel, so that ISPConfig can be accessed using https:// instead of http://. To achieve this, just press ENTER when you see this question: Do you want a secure (SSL) connection to the ISPConfig web interface (y,n) [y]:. Operating System: Redhat or compatible, unknown version. Following will be a few questions for primary configuration so be careful. Default values are in [brackets] and can be accepted with <ENTER>. Tap in "quit" (without the quotes) to stop the installer. The error message "usage: doveadm [-Dv] [-f <formatter>] <command> [<args>]" can be ignored, in case that you get it during ispconfig installation. # The default language for this server. The system is now ready to be used. In order to learn how to use ISPConfig 3, I strongly recommend to download the ISPConfig 3 Manual. On more than 300 pages, it covers the concept behind ISPConfig (admin, resellers, clients), explains how to install and update ISPConfig 3, includes a reference for all forms and form fields in ISPConfig together with examples of valid inputs, and provides tutorials for the most common tasks in ISPConfig 3. 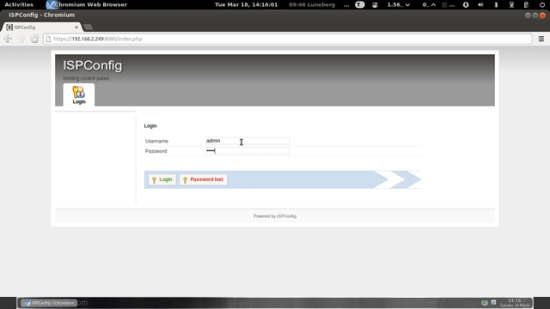 It also lines out how to make your server more secure and comes with a troubleshooting section at the end. With the ISPConfig Monitor App, you can check your server status and find out if all services are running as expected. You can check TCP and UDP ports and ping your servers. In addition to that you can use this app to request details from servers that have ISPConfig installed (please note that the minimum installed ISPConfig 3 version with support for the ISPConfig Monitor App is 3.0.3.3! ); these details include everything you know from the Monitor module in the ISPConfig Control Panel (e.g. services, mail and system logs, mail queue, CPU and memory info, disk usage, quota, OS details, RKHunter log, etc. ), and of course, as ISPConfig is multiserver-capable, you can check all servers that are controlled from your ISPConfig master server. For download and usage instructions, please visit http://www.ispconfig.org/ispconfig-3/ispconfig-monitor-app-for-android/. At my case, only AWstats not working, but Webalizer yes. If the SEND TO address is an gmail.com user (ex. *@gmail.com), then the postfix use a relayhost (smtp.gmail.com or another), but if the adressee isn't *@gmail.com then via Postfix direct. Is there any tutorial? 1. How do I get back the original login page for phpmyadmin ? Also I get this explorer box when I want to log out & to add salt to the wound it doesnt sign out, just reverts back to the same page ??? 2. I would like to acces squirrelmail on http not https so how do I cahnge it back ? Absolutely brilliant tutorial. I've followed step by step from after CentOS install (already had it installed via VM), and managed to install ISPConfig3 within 30 minutes! Highly recommended tutorial. The Perfect Server - CentOS 6.5 x86_64 (Apache2, MySQL, PHP, PureFTPD, Postfix, Dovecot and ISPConfig 3) as ready to use virtual machine image download in ovf/ova format, compatible with VMWare and Virtualbox.